Never be afraid to walk around in your shower anymore. Suction shower handrails provide the stability you need while being portable and removable. Why are Suction Handrails Useful in a Shower? It is not always possible to drill a hole into your walls especially when you live in a rented apartment. Drilling a tiled wall also requires a lot of skill and the proper tools. If you ever make a mistake, the whole area would have to be replaced and redone. Shower handrails with suction jumps through this entire step by giving the user a portable and removal option that does not leave marks or cause any damage to the walls. 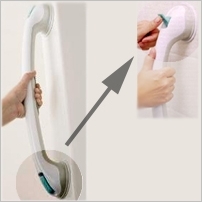 Here are some steps to take before the installation of the suction handrails. Make sure the surface is smooth. Any bumps in the surface will allow air to enter suction and the handrail vacuum will not support your weight. If the suction cup is larger than the tiled surface area, the grouted areas can allow air to seep into the suction vacuum. This scenario must be avoided because the holding strength of the handrail will be compromised. Once air gets in, there is no guarantee the product will work. Please be safe! Clear the applied area of any debris. Any debris will also prevent a strong vacuum from the suction shower handrail to the wall. Wipe the area clean of liquid and let it dry. Do not apply on wallpaper or any painted walls that will tear off with a power suction. These do not provide the stability and strength you require. Make sure the walls are strong to keep the handrail vacuumed sealed to the walls. Certain dry walls are too weak to support heavy weights. Grab a Hold of that Suction Rail! A good tip to remember is to test the shower handrails’ suction before you actually require it. Give it a nice tug and make sure to test it as often as you can. Vacuum seals can, after time, lose it’s power in a humid environment. The best areas to apply suction shower handrails is on smooth tiled and ceramic walls. Fiberglass material also works. You can turn any shower environment into a handicap shower. There are handrails that can be broken into several pieces so they fit your lugguage or suitcase and be taken on your trips or vacations. And since they do not leave marks on walls, you can use them in a hotel environment.